Joseph Cook was born on December 7th 1860 in Vale Place, Silverdale, North Staffordshire, and he moved to the nearby street of Brookside when he was three months old. The properties had thatched roofs with one room upstairs and one down. Detached from the house, was a wash house and privy. At the back of these houses ran a rat infested brook, which ran brown with waste from the nearby collieries. 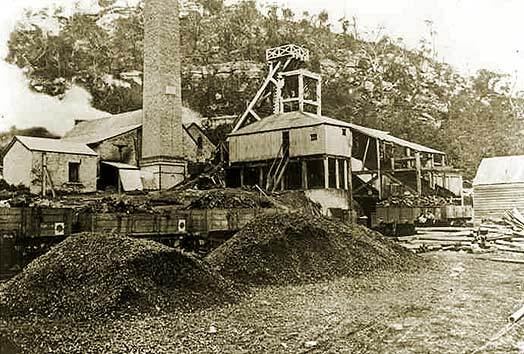 In the previous ten years the population in Silverdale had more than doubled from 2,000 to 4,464 due to the exploitation of mineral resources in the area. Joseph was the second child of the family, though his older sister Sarah died when she was seven years of age. By 1872 Mrs Margaret Cook had given birth to five more children. Joseph was educated at St. Luke's Church of England school, where sexes were not allowed to mix during school hours. They were taught separately and had their own playgrounds. Parents contributed a small amount towards the expenses incurred in educating their children at the school. Sometimes this was beyond the means of some families and when the Primitive Methodists opened a day school in the High Street there was a tendency for some parents to transfer their children there, as fees were lower. Parents often got into debt for unpaid fees. Conditions at St. Luke's were not conducive to good education; classrooms had extremely high ceilings with large elevated windows so that the children were not tempted to look out of them. Consequently the rooms were lofty and difficult to heat. According to the school logbook, heating was by coal-fired stoves, which constantly smoked. A great deal of inconvenience was caused in the classroom as a result of great clouds of soot and smoke being emitted. It was not unusual for the classrooms to be too dark to work during afternoons, particularly in autumn and winter months. Common colds, coughs and sore throats which were encouraged by the conditions in the school also kept large numbers of children away, especially in the winter as children being soaked when going home at lunch time and having no dry cloths or shoes to change into that would allow them to return to school in the afternoons. When Joseph was nine years of age, he started work underground at one of the local collieries, where he carried out many jobs, which was normal for any pit boy at that time. But as a result of the Elementary Education act of 1870 he was compelled to return to school. His short experience in the mine taught him to appreciate the value of education, and with the help of the headmaster and his staff, his intellectual activity was stimulated. At the age of 12 Joseph left school for the second time and he returned to the pit. However, as a result of his headmaster's attention together with that of his parents, a strong ambition to improve his position became implanted in him. The pit he worked at was known locally as the "Big Pit" situated on the north side of Scott Hay road. Conditions at the pit were bad, with some long steep gradients and a hot atmosphere. Miners referred to it as the "Hell Hole". Joseph lost his father in a tragic mining accident on 8th April 1873 while repairing rails in a dip. A full tub of coal came down the dip and struck him, tearing some of the rails up at the same time. The coroner, Mr. J. Booth, recorded a verdict of accidental death. William Cook was only 39 years of age. He left behind a widow and six children. With the death of his father, Joseph became the head of the family and its principal breadwinner. With this new responsibility and looking after his family, he rapidly grew to manhood, with a highly developed sense and protective responsibility. The Cook family then became associated with the Primitive Methodists and Joseph took advantage of this movement's aid by borrowing books from the local high Street chapel. In his lunchtime break down the pit, he would study by the light from his pit-lamp. He also chalked on the pit tubs to improve his spelling, writing and arithmetic and when he went home he continued to study in the evenings by candlelight. It was said he would spend his last few pence on a book. Vale of Clwydd Colliery, taken around the time that Joseph Cook worked there (late 1800's). Photograph taken before a bush-fire damaged the buildings and head-frame. Thanks to John Oates for pointing me towards this picture obtained at the State Library of Victoria and furnishing me with the information. 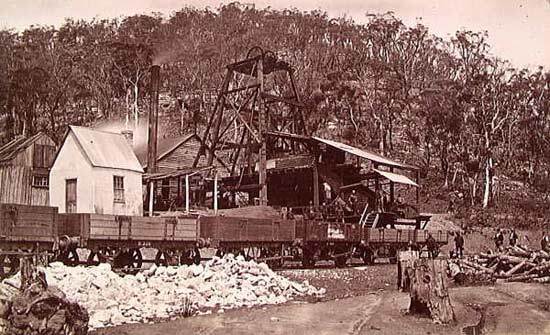 In 1885 he migrated to Australia, Lithgow in NSW, where he worked in the mines. Joseph Cook was 31 in 1891 when he became Labor member for Hartley in the New South Wales parliament. Three years later, he was a minister in George Reid's Free Trade government. He joined the first federal parliament in 1901 as a Free Trade member and, despite being described as having 'no glow', held the federal seat of Parramatta for 20 years. 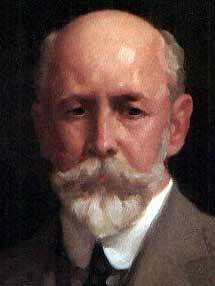 He was appointed Postmaster-General in the Reid Government then in 1898 he became Minister for Mines and Agriculture. This man Joseph Cook, from these humble beginnings amazingly become the Prime Minister of Australia on 24th June 1913 at the age of 52. After a bush-fire damaged the buildings and head-frame. Thanks to John Oates for pointing me towards this picture obtained from the Lithgow Regional Library and furnishing me with the information. He was also one of the Australian delegates to the 1918 peace conference, and after 30 years as a member of parliament he resigned to take up the appointment of High Commissioner in London to represent Australia. On his retired in 1927 he returned to Australia where he died 20 years later at the age of 86.